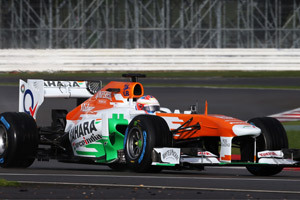 Sahara Force India unveiled its VJM06 in the Silverstone paddock on February 1. Paul Di Resta took off the wraps of the car on his own. No other driver was present, nor did the team make any announcements on its second driver yet. The VJM06 is the third car to be overseen by Technical Director, Andrew Green, and attempts to build on the strengths of the 2012 car. With stable technical rules the car is more evolution than revolution with the removal of the ‘step’ nose being the most obvious visual change. The team mainly aims to increase the consistency that it was lacking during 2012, and its targets are now "to qualify regularly in the top 10" the 2012 target of ending 5th in the constructors' championship proved to be too ambitious, mostly due to their lack of pace in the first half of the season. In the development of the VJM06, the team mainly focused to optimise tyre usage by redesigning both the front and rear suspension for more set-up freedom. In this respect, the technical director said at the launch: "The incremental performance gains are harder to find due to regulation stability. It’s getting harder to find gains. Consistency will be key to this season. We’ve done a lot of work analysing how we used the tyres last year. So keeping the tyres working in their sweet spot is the key to it and on top of that we keep on bolting on extra downforce. Our focus in winter testing is going to be all around the new tyres. It’s the one thing we don’t understand." The car in its launch guise indeed shows little aerodynamic changes, with the removal of the stepped nose the most obvious change. A change of the regulations allowed a non-structural carbon fibre part to cover off the step that was so visible on the 2012 cars, including the Force India VJM05. The sidepods are seemingly identical to those of the VJM05 at the final races of 2012, just as well as the coanda style exhaust and basically all visible components around and behind the cockpit.